Measures of financial conditions, generally interpreted as effects of monetary policy on the real economy via channels such as exchange rate, short-term and long-term bond yields, stock valuation, and credit spreads, have loosened to peak dot-com bubble levels. This development came despite a steady rise in short-term interest rates as investors priced-in another 2¼ hikes by the end of 2018 thanks to optimism among FOMC participants. As seen in prior cycles, changes in short-term interest rates alone had yielded little effect on financial conditions, as buoyant risk sentiment strengthened equities, corporate bonds, as well as various forms of “esoteric” investments. This led to debates among policymakers on whether the Fed should hasten the pace of tightening, which further exacerbated pressure on short-term Treasury yields while leaving long-term rates largely unchanged – hence a flatter yield curve. Despite talks of a steeper rate path, post-crisis financial and policy developments have reduced short-term rates’ impact on broader financial conditions. Plentiful non-bank funding have shifted credit demand away from commercial loans and depressed bank-loan growth. 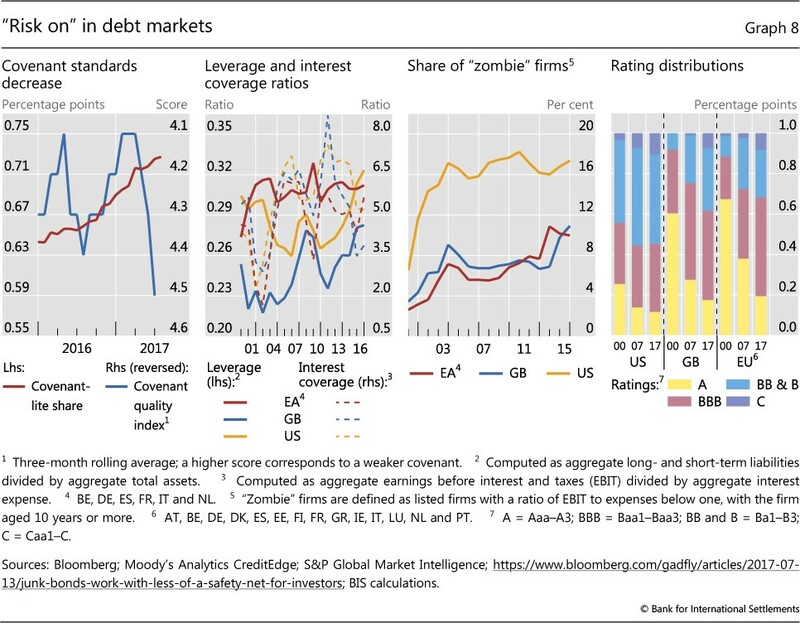 In its place, a ballooning credit market with record (and longer maturity) issuance became the “new normal.” It would make sense for business entities to “borrow for longer” with private capital crowded out by central banks now clamor for long-term cash flows, and this dynamic has tightened credit spreads to record narrow levels. Prolonged curve flattening from the aforementioned easy financial conditions (low long-term rates) despite rising short-term rates would steadily increase institutions’ vulnerability to potential balance sheet shocks, as investors continue to add low quality and illiquid assets to “enhance returns.” While this alone would not trigger a recession, willingness to warehouse risks highlight growing complacency, which previously pave the way for balance sheet contagion risks in 2008. These market developments support a thesis that financial excess would rise in lock-step with the length of curve flattening (ineffective tightening), and the Fed would be unknowingly falling behind the curve to heighten stability risks. Given term premium suppression (via QE) reduced volatility and induced investors to buy risky assets to boost returns, a sustained rise in long-term interest rates would give investors more options to achieve yield targets, thus making risk assets appear less attractive and ultimately erode demands for yield and tighten financial conditions. Hence, a flat yield curve can be seen as a yardstick of ineffective policy normalization focusing on the “wrong part of the term structure.” This phenomenon is far from cost-less, for there are financial, social, and political stability implications.